Halloween has passed us by, leaving candy-jaded palates and shriveled up old jack-o-lanterns by the wayside. After one week, our jack-o-lantern, which sat atop a lamppost covered with a sheet, looked as if he had sucked on a lemon. His face had turned in on itself and he was relegated to the trash pronto. My remaining stash of candy will follow post-haste. However, we still see pumpkins and other squash varieties in the markets and the thought of the warm, earthy, delicious taste of these vegetables whets my appetite. We made pumpkin french toast and it was delicious. No special recipe needed – for four servings, just add a half-cup or so of canned pumpkin puree to your egg and milk mixture along with 1/3 cup sugar and a sprinkling of pumpkin pie spices (cinnamon, clove, ginger and nutmeg) and cook as you normally would. I plan to fix a pumpkin soup later this week and will provide the recipe when I do. Pumpkin pancakes will be on our breakfast menu this weekend, served with real maple syrup, not the fake stuff. I have a butternut squash sitting on the counter. I will peel, cube and roast it next week as a side dish to a pork tenderloin I’m planning to stuff with dried fruit. An acorn squash also awaits my attention. Fall also gives us the opportunity to savor the unique tastes of the many root vegetables available. 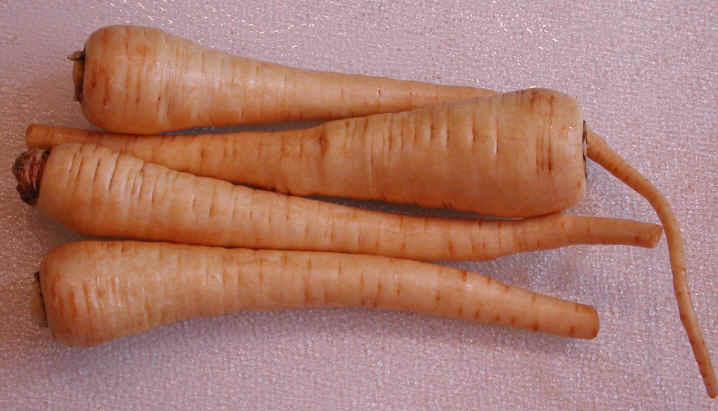 I have selected a few recipes using parsnips, one of the vegetables that I neglect, unfortunately. We enjoyed one this week, and will be having another one next week. The recipe I followed this week was found in the September, 2008, issue of Southern Living. The accompanying photograph of the dish caught my eye and as soon as I saw that parsnips were included, I decided to give it a try. I’m glad I did. We both thought it was a great dish, and one that can be adapted in a few ways. It calls for chicken, but would work just as well with pork chops. I followed the recipe with only two exceptions. First, I did not use the “skin-on” boneless chicken breasts called for; I used “skinless” boneless breasts. Also, it called for whole wheat flour for dusting the chicken. I used white flour. I found the pan sauce delicious, but a bit skimpy. next time I make this, I may double the amounts of shallots, and Marsala. 1. Cut leek lengthwise and wash carefully. Thinly slice white part crosswise and discard greens. Place leek, parsnips and half of the thyme leaves in a microwave-safe dish with 1/4 c. water. Cover and microwave on high until easily pierced with a fork, about 5 minutes. Drain, toss and set aside. 2. Preheat oven to 400 degrees. Lay chicken, skin-side down, on waxed paper on a hard surface; cover with another layer of waxed paper. Pound to an even thickness of 1/2 inch to facilitate even cooking. In a shallow dish, mix remaining thyme, rosemary, salt, and pepper with flour; dredge both sides of chicken. 3. Add 1 1/2 tablespoons olive oil to parsnips, leeks, and thyme; toss to coat. Season with salt and pepper. Place in top third of oven and roast for 15 minutes. 4. Coat a 12-inch skillet with remaining 1 1/2 tablespoons olive oil and place over medium-high heat. When oil is hot, but not smoking, place chicken breasts in pan, skin-side down, and brown for 2-3 minutes. (Do not move; they’ll release easily once browned.) Turn and brown other side, 2-3 minutes. Transfer to a serving platter, cover, and keep warm. 5. Reduce pan heat to medium-low and add shallots and garlic. Saute for 1-2 minutes, until soft. Increase heat to medium-high and add Marsala or other liquid, scraping up brown bits. When liquid reduces by half (about 1 minute), whisk in parsley and soy sauce. 6. Remove chicken skin. Surround chicken with parsnip mixture and top with pan sauce. Garnish with rosemary sprigs. Mac and I love scalloped or au gratin potatoes – almost any potato casserole, actually. I have several different recipes that I make now and then, some with ham and other vegetables, and most with just potatoes, onions and cheese. I found a new one not long ago and decided to prepare it the day before yesterday. It called for celery root (celeriac) and parsnips, not ingredients that I usually have on hand. After a trip to a large grocery that I was sure would carry them, we came home ready to experiment. The two other root vegetables add a subtle taste to the more bland potatoes. While parsnips, especially old ones, can be bitter, they add a slightly nutty taste to the casserole. 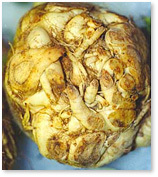 Celery root has a slight celery taste, but it is hard to describe adequately. It can be eaten raw, or cooked. This recipe is from Cook’s Illustrated magazine’s website and, I believe, is a variation of a recipe for scalloped potatoes printed in an earlier issue. While the authors recommend using a food processor to quickly and evenly slice the vegetables to 1/8″, I had no difficulty using a santoku knife for all the slicing. It would have taken more time to get my processor, set it up, and then clean it. I rarely use it for slicing ingredients for ordinary recipes. If I were to make enough for a large group, I would probably use the processor. 2. Melt butter in large Dutch oven over medium-heat until foaming subsides. Add onion and cook, stirring occasionaly, until soft and lightly browned, about 4 minutes. Add garlic, thyme, salt and pepper; cook until fragrant, about 30 seconds. Add celery root, parsnips, chicken broth, cream, and bay leaves and bring to simmer. Cover, reduce heat to medium-low, and simmer for 5 minutes. Add potatoes, bring mixture back to simmer, cover, and cook until potatoes are almost tender (paring knife can be slipped into and out of potato slice with some resistance), about 10 minutes. Discard bay leaves. 3. Transfer mixture to 8-inch square baking dish (or other 1 1/2-quart gratin dish) and press into an even layer; sprinkle evenly with cheese. Bake until cream is bubbling around edges and top is golden brown, about 15 minutes. Cool 10 minutes before serving. 4. To make ahead: Once the scalloped vegetables have been transferred to the baking dish and pressed into an even layer in step 3, they can be wrapped in plastic wrap and refrigerated for up to 24 hours. When ready to bake, add the cheese, cover with foil, and bake in a 400-degree oven until the mixture is hot and bubbling, about 45 minutes. Remove the foil and cook until the cheddar begins to brown, about 30 minutes longer. Let cool for 10 minutes before serving.